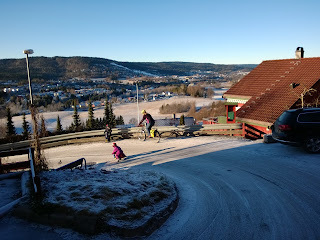 Winter is late in Oslo. Its December and I haven't gotten out the studded tires for the Niholas. But perhaps that is not so impressive; a Nihola has three wheels so a bit of ice is not likely to cause anything surprising to happen. 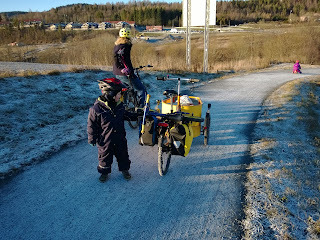 The other weekend, we even took a little day tour (maybe 25km on significant hills) in lovely sun with a bit of snow and ice on the ground. There are a few things to note in order to minimize problems with this. 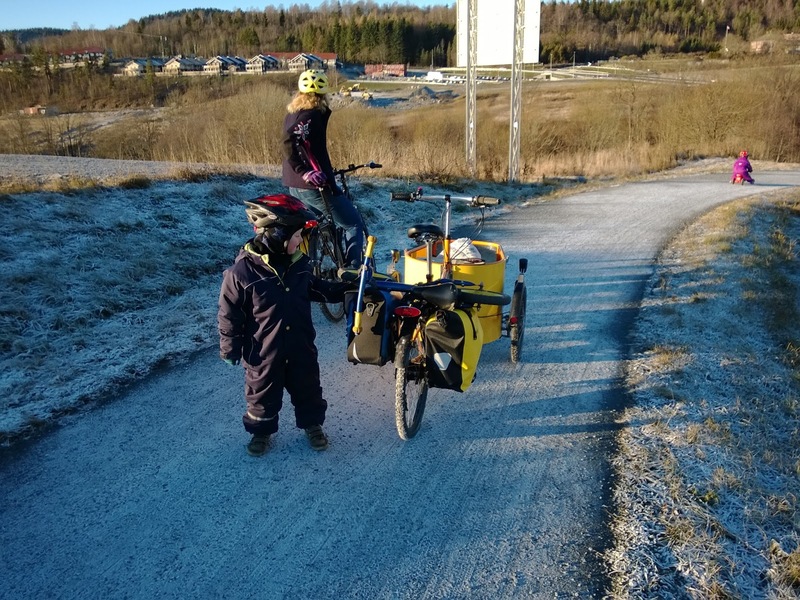 First, there should be a good load on the rear tire, in this case, several liters of water and hot tea, kilos of tools and random junk, and sometimes a running bike. It also pays to keep the tire pressure a little on the low side. Oh, and the kids can get really cold sitting there so bring all sorts of warmth accessories. We brought an old blanket, a foam mattress for the floor, and left the roof at home. Anyway, its kind of interesting to spin a tire on a trike. Its more of a curiosity than it would be in a car, because you're sitting right there looking at the tire and the road, everything is fairly quiet, and you can really feel the interaction of inertia, tire and ice. Often enough I am going along and start slipping (with the back tire), make it a bit farther, then start sliding backwards and either use the front brake to stop the backwards slide, or just slide into an area of traction. The idea is then to plot a new course for the back tire, avoiding the ice. It isn't necessarily helpful to get off and push, because probably you can't do any better on foot than on the pedals. However it can sometimes be useful to move the rear sideways, onto a better surface. While this is all going on, you can have a calm chat with the kids. Lets all sing the praises of three wheels. But that is kind of off topic. On this little tour we took, I found only a small area that was icy. There was also one good climb where I was happy to use the 15 gear-inches ratio, and which also was on snow, ice and gravel. I could feel the tire slip here and there, but things went well enough. So the studded tires are sitting in the basement, for now.